Scientists from the Niels Bohr Institute almost choked on their afternoon coffee at August 17th this year. 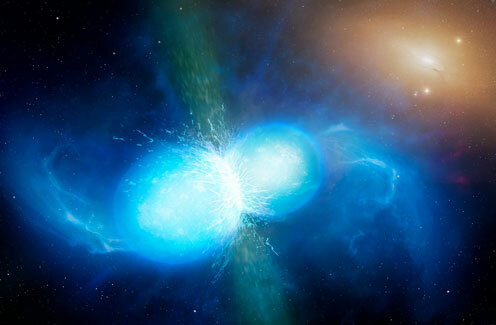 The time was 2.41pm when what the astrophysicists from the Center for Transient Astrophysics and Dark Cosmology Centre (DARK) had only dared to hope for happened: Three of the most sensitive monitoring stations measured gravity waves as well as the light from the collision between two neutron stars for the first time, which resulted in the formation of a kilonova. The combination of gravity waves and classical astronomy made it possible for the astronomers to calculate the distance to the galaxy along with the speed in which it moves away from earth due to the expansion of the universe. The extraordinary event marks the very first time when astronomers have successfully combined the signal from gravitation wave detectors with data from telescopes that measure electromagnetic radiation. In other words, this is the first time in history that humans have successfully measured both sound and light from the same incident in space. “This is a gigantic discovery that opens up for a new way of investigating the universe. We have finally combined the two separate ways of looking at the universe by observing the same incident in both light- and gravitation waves. That marks a milestone” says DNRF-financed Niels Bohr professor Enrico Ramirez-Ruiz, Center for Transient Astrophysics, who has played a significant role in delivering the theoretical frame for the new observations and data processing. Ramirez-Ruiz was also a part of the team of researchers that first discovered the kilonova 11 hours after the two neutron starts collided. This happened on the last day of a six-day workshop held at the Niels Bohr Institute directed by Ramirez Ruiz’s Niels Bohr professorship. The groundbreaking discovery is the step into a whole new astronomical era, and it is also meaningful for humans understanding of and answer to one of the great puzzles of science: How the heaviest elements of the universe have emerged. “We could tell that the kilonova had gone from blue to red. This is only possible if heavy elements are made. This means that it is in the collision between neutron starts that some of the heaviest elements on Earth were made. That is fundamental science and insanely interesting” says professor Jens Hjorth, who became head of center for DARK back in 2005, where the DNRF granted first 65 and later additional 49 million DKK for establishing the centre. Up until now humans have only known for sure how the three lightest elements hydrogen, helium and lithium were made by ‘the Bing Bang’. Scientists are now one step closer to finding out how the other elements – and especially the heaviest ones like gold and platin – were made.